It’s getting more difficult by the day to keep up with the changes in the ever-evolving cryptocurrency market. Even for the lucky few of us who get to spend our days reading whitepapers and refreshing coinmarketcap.com, the sheer volume of information is overwhelming. The first way we sought to address the problem was with long-form articles such as the Top 50 Cryptocurrencies and the Top 20 Ethereum Tokens. These articles help to introduce investors to new projects in a concise manner, as well as provide links to resources for further research. However, we felt that the information could be distilled even further. 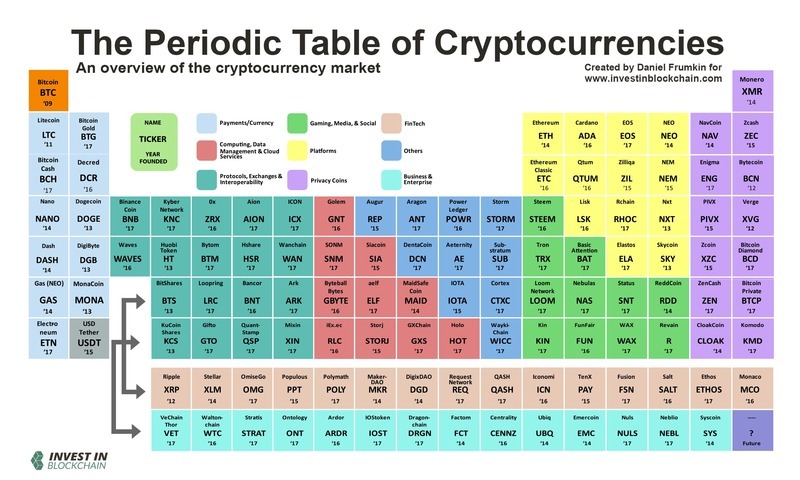 And so, in an effort to create the most concise possible overview of the cryptocurrency market, we began work on a Periodic Table of Cryptocurrencies. Do note that there wasn’t a set criteria for deciding which cryptocurrencies would make the table, nor for determining the order in which they are included. The cryptocurrency market changes incredibly quickly, so we may update this table in the future to include new projects that have gained relevance and to take out any projects that have lost it. For a more scientific take on a periodic table of cryptocurrencies, check out Dr Aleksandar Arsov’s proposal on blockchain categoization. His paper puts forth the idea of a “theory of cryptocurrency periodic table policy in Altcoin markets with focus on supply rigidities identified with aggregate supply in cryptocurrency markets. ”If you’d like a quick summary of cryptocurrency porjects, you may like Top 100 Cryptocurrencies Described in 10 Words or Less. The Periodic Table of Elements consists of 118 elements that fall into 8 different categories. Try as we might, 8 categories couldn’t quite cut it for cryptocurrencies, but we managed 9. These categories are listed below, along with brief explanations of the factors that contribute to a coin or token being included in a given category. Note that there are many cryptocurrencies that could fall into multiple categories. That’s particularly the case with Business & Enterprise vs. Platforms. 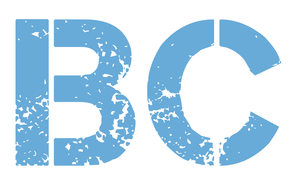 Learn More: What is Bitcoin Cash?, What’s Up With Bitcoin and Bitcoin Cash? Learn More: What is Dash?, Will Dash Hit its Stride in 2018 Despite Development Delays? Learn More: What is Nano (Formerly RaiBlocks)? Learn More: What is Decred?, Decred 2018 Roadmap: Will Decred Finally Grab the Attention of More Crypto Enthusiasts? Learn More: What is DogeCoin? Learn More: What is DigiByte? Learn More: What is Electroneum? Whitepaper: Currently unavailable, may be found here in the future. Learn More: What is Bitshares? Learn More: What is 0x Protocol? Learn More: What is ICON? Learn More: What is Wanchain? Learn More: What is Byteball?, Is Directed Acyclic Graph (DAG) Blockchain’s New Competitor? Learn More: What is Maidsafe? Learn More: What is Augur? Learn More: Aragon: Can the Economy Be Built on Blockchain? Learn More: What is Aeternity? Learn More: What is NEO?, 5 NEO Projects to Get Excited About, Will NEO Have a Smooth Road Ahead? Learn More: What is NEM? Whitepaper: No whitepaper, but you can read in-depth documentation here. Learn More: What is Nxt? Learn More: What is Steem?, Steemit Review: How Does it Work and Can You Really Earn From It? Learn More: What is Nebulas? Learn More: Should You Invest in Zcash, What the Future Holds For Zcash: Can it Win the Battle of the Privacy Coins? Learn More: What is Bytecoin? Whitepaper: Taken down from website, was previously here. Learn More: What is Iconomi? Learn More: What is Salt? Whitepaper: Currently unreleased, see here. Learn More: What is Dragonchain? Francisco Gimeno - BC Analyst Interesting exercise on crypto classification. It could help to understand the utility of the crypto groups too. For everyone is nice to see everything at one glance.